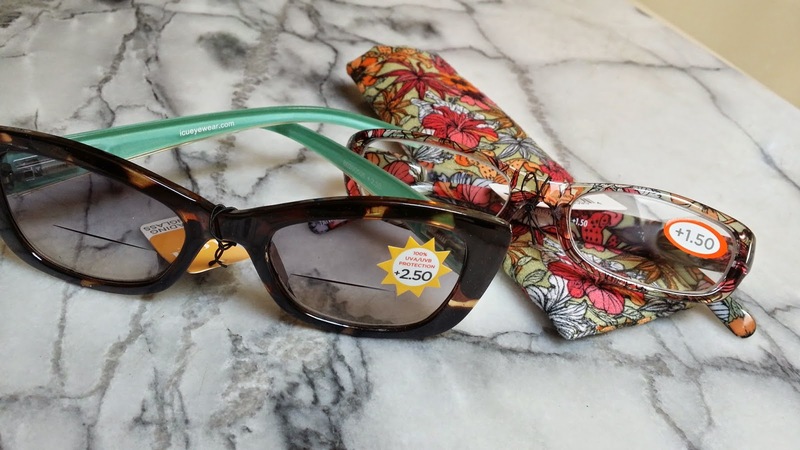 I was very thrilled when I was contacted by ICU Eyewear to try some of their new designs. They make some really lovely designs, and their prices are very affordable. They have reading glasses, sunglasses regular and reading sunglasses. Mostly all of their designs are under $30 and they have a few in the higher range but they are still under $100.00. Glasses are really an accessory. I remember when I was told I needed glasses in elementary school, I was so upset. I didn't want to wear glasses, but now, they have so many gorgeous designs, you enjoy being able to wear them! These were the 2 pairs which I was sent to try, and the first thing I thought was the very good quality they represented. They look like you would have paid much more than what their actual cost of under $26.00 for each one. I really love the designs, they are both different, but really fun. I also liked the fact that the one pair came with a matching case, just love the print design!! ICU Eyewear’s readers are scoring points everywhere they go! Summer fashion never looked so amazing with ICU Eyewear’s Orange Oval Floral Pattern Readers ($23.99), available on ICUEyewear.com. These oval readers embrace bright colors, which make them the perfect summer accessory! ​If you are ready for fun in the sun, grab the Light Blue Cat Eye Lifted Bifocal Reading Sunglasses ($25.95). Cat Eye frames are hot, hot, hot this summer! These frames are perfect for summer reading because they are polarized and 100% UV A and B ray protective; say hello to your anti-aging BFF. This shell pattern is really lovely, and also comes with a case as well, these tend to get lost very easy so the case really helps!! I am a sucker for animal print anything and rhinestones, very chic design here! ICU Eyewear is committed to creating a more sustainable business by making strides to reduce our environmental impact. I really love the fact that these glasses are environmentally friendly. It is really fabulous when you can help the environment as well as look chic! ICU Eyewear also carries glasses for men as well, you can check out their selection HERE. If you are in need of some reading glasses, I would highly suggest you check out their selection very soon!! Disclosure: Product provided by ICU Eyewear. The above is my honest opinion and review.